In this eHost review, we will review each and every feature of eHost.com including dependability, pricing, money back guarantees, customer support, hosting plans and also the pros and cons associated with it. So, let’s start the eHost web hosting review. The Texas-based company eHost.com has been working since 1998 as a distinguished online best web hosting provider. eHost is famous worldwide because of its inexpensive, cPanel centered shared website hosting services. 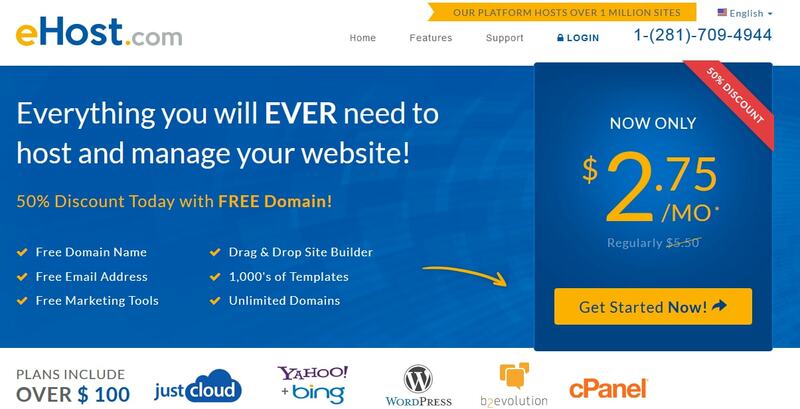 Alongside offering free domain name, eHost incorporates many useful features including drag and drop site builder for effortless website formation, 30 days money back guarantee and much more. eHost’s review primary focus is on coherence and simplicity. The company is offering cheap web hosting and website builder that is a very convenient tool which features more than 1000 pre-fabricated templates and gives beginners an opportunity to create beautiful websites quickly and accurately without applying any complex sets of coding. While talking about the performance of any website, the response and load time are the determinants that decide the efficiency of it. The response time basically decides how quick the visitor will connect to that specific site. The load time, on the other hand, refers to the period a user will need to wait for the page to get completely load. The uptime statistics for the eHost hosted sites are around 99.9%, which is exceptionally good considering that this is a shared hosting. eHost’s fast install tool allows you to install your preferred software in no time. This option includes the commonly used eCommerce, content management and blogging platforms including WordPress, Joomla, Drupal, PrestaShop, OS Ticket, Magneto, B2Evolution, Concrete 5 and phpBB. In addition, you can also install other software by using a QuickInstall icon available in the control panel. This quick install tool will enable you to install the current variant of number of software in merely few clicks. By doing so will help you save lot of your time and effort as you don’t require to manually create the database and transfer the files to the server, the rest will be handled automatically. Is eHost Suitable for WordPress? As we’ve already mentioned, eHost provides cost-effective shared hosting services. They enable users to install and host WordPress sites on their servers. The question is, are they really good for WordPress hosting? As a matter of fact, eHost is quite compelling for small WordPress sites. Obviously, they provide extensive WordPress help, and we also know that shared hosting plan generally handle 10 to 20k monthly traffic. However, small WordPress sites getting few hundred visitors everyday will surely have a top-notch performance with eHost. Is eHost Suitable for eCommerce hosting? eHost assimilates with MojoMarketplace, which apparently means you can conveniently install the well-known platforms to your site hosted with eHost. Some of the shopping carts you can avail on your eHost account include AgoraCart, CubeCart, ShopSite, OSCommerce, OpenCart, Magneto, PrestaShop, seotoaster e-commerce, TomatoCart and Zen Cart. An eCommerce site needs a lot of resources than a conventional company presentation site. Despite the fact that eHost.com includes this incredible feature, it’s still not appropriate for long run eCommerce hosting. Is eHost Good for Small Business Websites? When you hammer our deal with eHost.com, you can select between two options – cPanel and site builder hosting. The selection you make should depend on your personal preferences. If you’re a beginner and looking to a fast and convenient way to get started then you should opt for the site builder option. However, if you want to have full authority over your site or wish to enhance its functionality in the long run, cPanel hosting is what you should opt for. Site builder allows you to quickly build your own site with absolutely no need of applying complex coding. It’s easy-to-use drag and drop mechanism allows you create web pages, adding galleries, layout, etc. In addition to that, there are myriad of free templates that can help you give your website a professional touch. cPanel on the other hand, enables you to install your favorite open source software such as WordPress. Notably, WordPress, which is believed to be one of the best open source software available these days works wonderfully with the site builder, giving users plethora of choices to experiment with. Is eHost Employing Weebly as Website Building Platform? The answer is ‘No’. eHost uses a more powerful and compelling website building platform provided by WebsiteBuilder.com and is not employing Weebly as a site building platform. eHost account is handled through personalized cPanel control panel. Once you sign up with your eHost account, you can select cPanel to handle your sites. Noticeably, it’s a similar cPanel that you’ve already used on other cPanel hosting services. The process begins when you first log in to your eHost account. You then will be required to select between website builder and cPanel. If you wish to quickly get started, you can select a website builder option, but if you want to install other open source software to your domain, you should select a cPanel option. After choosing the Site Builder option, it’s time now to select the domain you wish to create a website on and click to make a start. Select your preferred template and begin editing. You can add anything you like such as image galleries, text, headings, form pages or images. The best part is you don’t need any programming skills to create the website of your choice, and by just using drag and drop builder option, you can handle the layout of your site. eHost lands with an amazingly competitive pricing plan. Once you signed up, you can also purchase extra eCommerce functionality. ⇒ The basic 12 months package with 50% savings will cost you $4.99 per month. ⇒ The 24 month package with 50% savings, on the other hand, will cost you $3.49 per month. ⇒ Last but not the least, the 36 month package with 50% savings will cost you $2.75 per month. ⇒ However, you need to pay $10.49 per month if you select an added eCommerce package. You can purchase eHost through a credit or debit card and PayPal. In addition to that, you can also use few electronic cards, but prepaid and gift cards aren’t acceptable. Moreover, bank wire transfer, checks, cash or money orders are also not included in the list of acceptable payment methods. With an ongoing 50% discount, eHost for $2.75 per month offers all the basic features that are required to start and manage a fully-functional small website. The availability of cPanel (control panel) enables you to enjoy full control on your site. You can include new domains or install custom scripts like WordPress, Joomla, Drupal quickly and effortlessly. The presence of drag and drop tool makes this hosting option an ideal choice for beginners. The site builder enables you to swiftly build a personalized web page, upload pictures, form, slideshows, add text and publish content without the requirement of writing any code. The hosting service comes with a 45-day money back guarantee option, giving you plenty of time to analyze the service and support offered by eHost. You can try their service and if you’re not satisfied you can ask for refund. This is plus point. Getting in touch with the 24/7 customer assistance is as straight forward as it could be. You can connect with a dedicated phone line or can also do a live chat which is supported by well-trained yet friendly support staff round the clock. In addition to that, you can also forward your queries or concerns via email. eHost doesn’t offer any free trial opportunity for its users and you’ve to invest in the service to test the results. Well, it’s not a major issue. Sadly, eHost isn’t compliant with HIPAA regulations, which apparently means, you need to host your sensitive health information with any other hosting service. eHost comes with a limited eCommerce tools on standard subscription and you need to buy added tools for enhanced functionality. eHost is an amazing all-in-one solution for beginners and small business owners. I’d recommend eHost to everyone to try out their service. If you’re seeking a new host for busy blogs or high traffic websites, using eHost is definitely a good idea. What do you think about eHost web hosting company? Please share your opinions in the comments section given below and don’t forget to share this eHost review with your friends on the Social media platforms. If you’ve any suggestion or question, feel free to ask in the comment box below. I’ll assist you as soon as possible. Loved this unbiased eHost review. I guess ehost seems pretty good for the middle sized blogs or blogs with medium traffic. Will certainly recommend to friends. Thanks for liking the eHost review and for your comment and recommendation, Rajukmar! I have been an eHost customer for more than 2 years with this comment posting email registered for the service. Only reason I am still with them is because of their Chat support, and other than that, there is nothing significant with them, and I would advise everyone always be cautious with eHost when you have your credit cards recorded in their profile as so far I have faced 3 times surprise charges to my account. When I contacted their support they were not very helpful in refunding.